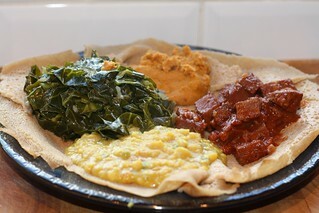 This entry was posted in Papa Tofu Loves Ethiopian, Vegan Eats World by efcliz. Bookmark the permalink. That zine is easily one of my favourite cooking publications! That all looks fabulous! I was surprised at how entirely delicious the seitan tibs were from Vegan Eats World. I’d never had a dish like that at any Ethiopian restaurants I’ve visited. Hi from a vegan in Australia! I’ve yet to try Ethiopian food but it seems like it’s got influences of African and Indian cuisine. Yum. Did you make the seitan from scratch? Yes. I make big batches and keep them in the freezer. is the recipe on your blog somewhere?